This design is perfect for the hipster in your life. 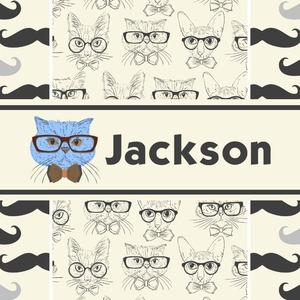 It combines hipster cats with mustaches to make the perfect all around hipster design. We have used two different backgrounds - the hipster cats and the mustache print. We chose the sophisticated color palette of cream and grey tones. The design is fully re-color-able - so you are free to change it to any colors you like - we also really like the vintage cream and brown tones..
We chose the graphic & text on ribbon style for the main design; a chose a full color graphic of one of the cats. We also have other hipster patterns and design in our system, so browse around and see what you fancy.